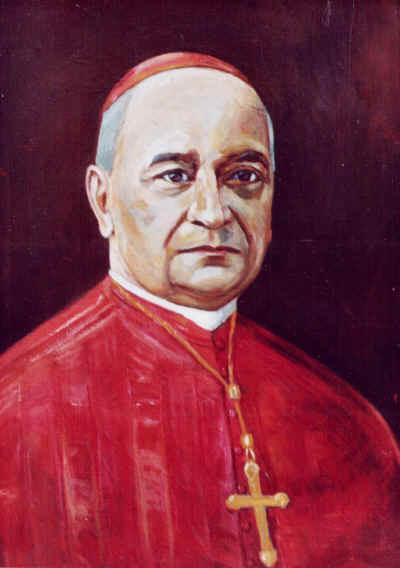 CARDINAL DOMENICO IORIO ( OR JORIO) WAS BORN IN VILLA SANTO STEFANO ON 7TH OCTOBER 1867. CONCLUDED THE ECCLESIASTIC STUDIES AT THE SEMINARIUM OF FERENTINO AND HE WAS ORDERED PRIEST ON SEPTEMBER 1891 IN PALESTRINA. HE GRATUED IN THEOLOGY AND "UTROQUE JURE" AT THE PONTIFICAL ROMAN SEMINARIUM OF SAINT APOLLINAIRE. ON THE 1898 HE WAS NAMED SEGRETARY OF APOSTOLIC DATARIA AND THEN PREFECT OF THE MATRIMONIAL AFFAIRS. ON THE 1926 HE WAS SEGRETARY OF THE SAINT CONGREGATION OF SACRAMENTS. ON DECEMBER 16th, 1935 WAS ELECTED CARDINAL FROM POPE PIUS XII. HE PATECIPATED AT THE LATERANS PACTS BETWEEN THE ITALIAN AND VATICAN STATES LIKE ECCLESIASTIC DEPUTY VICAR OF THE WOMEN CONVENTS AND REGULATOR OF THE PIA UNION OF SAINT PAUL. ON THE 1932 HE FOUNDED A SCHOOL FOR CHILDREN ON HIS NATIVE COUNTRY DONATED THE ANCIENT PALACE OF COLONNA’S FAMILY TO THE NUNS OF PRECIUS BLOOD. HE WROTE SEVERAL JURIDICAL BOOKS. HE DIED IN ROME ON OCTOBER 21,1954 AND IS BURIED AT THE CHURCH OF SAINT APOLLINAIRE WHERE A TOMBSTONE ON THE VESTIBULE OF THE CHURCH REMEMBER ALL HIS LIFE.